If you are looking for The Ton’s Mid Summer Release post, go here. Welcome to day 2 of my Growing in Unity Girl week. For today’s card, I used Love Brings You Home. This was also fairly simple to make and I love how it turned out! 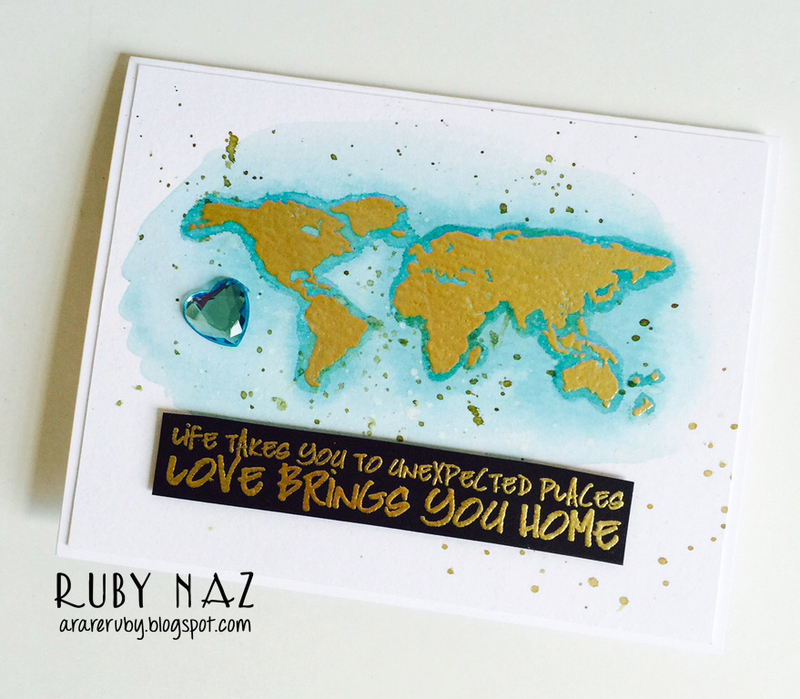 I stamped the world map onto watercolor paper (4″ x 5.25″) with VersaMark ink and heat embossed with gold embossing powder. I watercolored with Peacock Feather Distress Ink around it and waited for one coat to dry so I could add another darker layer around the edges of the continents. I added splatters of white, gold and shimmer mists over it. 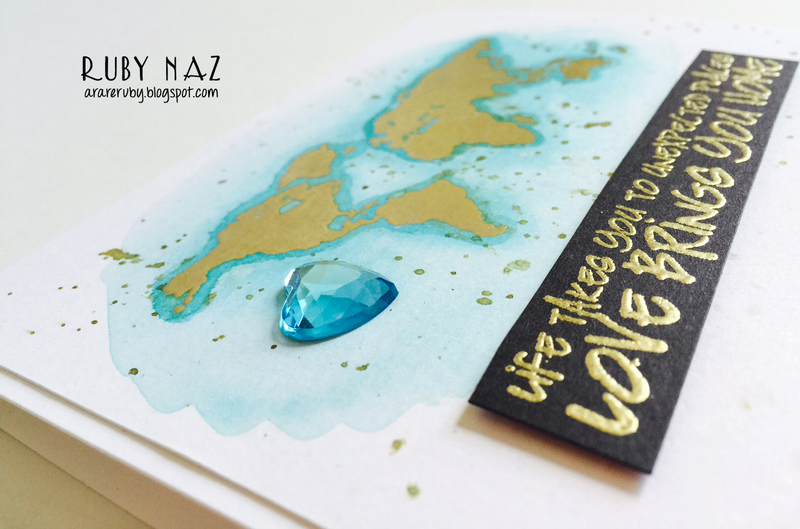 The sentiment was stamped onto black cardstock in VersaMark ink and heat embossed with gold embossing powder as well. I fussy cut around it and attached to the center with foam tape. I added an Aquamarine Heart Gem with Scor-Tape and taped down the whole thing over a white cardbase. Be sure to comment on each GIU post. I will be choosing two winners randomly from all comments — they will receive 25 random stamps from Unity Stamp Co. The winners will be announced on my blog next Monday, July 20, and they will have two weeks to claim their prize. WONDERFUL map! Love the gold and blue! fantabulous card! love the bling! This is great – it came together so nicely! Beautiful card!! The gold-on-black sentiment is such a great pop! Gorgeous! I love the combo of gold with watercolor. Love how the world is stamped in the gold.